I am collecting diaries more and more and I continue to be intrigued by thepossibilities of each blank page – what will it hold? I experience a mixture of sadness and exuberance when I think of lives laid out on a page or in a book. Personal histories of great loves, of journeys exotic and wonderful, of loss, fear and tragedy, of dreams and simple wishes. Enya: Well there is a strong theme of ‘book of days’, because I have a book of days, a diary. And I’ve always kept one. And it was Roma’s suggestion again. Ah, she likes to be able to associate with me, because I’m the one who’s going to sing. There is some Gaelic in it.. in the instrumental version.. and it talks about the beginning of the day and the excitement, the expectations, one has. And it’s the eagerness of what is to become of this day. And when Ron Howard approached us, for the film Far and Away, it was similar in a way because there were these two people, and we watch their ‘book of days’, their diary, of how they met up and how they went across to America. And so it was quite easy to interpret the lyrics with the song, because it was still associated with the theme that was originally there. 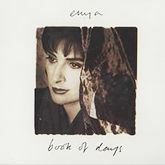 Enya originally recorded ‘Book of Days’ in Gaelic with a lot of vocalisation. When Ron Howard approached her to write a song for his upcoming movie ‘Far and Away,’ Enya re-recorded ‘Book of Days’ with English lyrics that turned around the theme of the film. The new version was consequently released as a single and replaced the original Gaelic one on almost all the pressings of the album (Taiwan retained the Gaelic version). The song was used in the first trailer for James Cameron’s 1997 ‘Titanic’ film before the actual soundtrack was composed. The video, directed by Michael Geoghegan, features scenes from the ‘Far and Away’ movie starring Nicole Kidman and Tom Cruise. It was not included on ‘The Video Collection’ nor ‘The Very Best of Enya.’ ‘The Video Collection’ replaced it with a ‘Top of the Pops’ performance and ‘The Very Best of Enya’ completely omitted the song. – my dreams could be tomorrow. This day ends together – far and away.